Fruits and vegetables come in different colors that reflect the nutrients they contain: greens are rich in chlorophyll and phytonutrients, reds in antioxidants, etc. A variety of fresh fruits and vegetables are necessary for a healthy body. But what about black foods? They haven’t exactly gotten the same press as greens. What makes foods black is anthocyanin, an antioxidant flavanoid pigment. It has been linked to reducing cancer cell proliferation and improving visual acuity. Don’t overlook these when making choices about incorporating all of the wonderful nutrients nature has to offer into your diet. Readily available, just one cup a day delivers a dose of antioxidants, hot or cold. One study found that black tea reduces recovery time, muscle soreness, and inflammation after an aggressive workout. Easy to find in most of North America, these yummy berries are good in yogurt, on cereal, or popping them plain. The antioxidant polyphenols protect you from signs of aging and they have lots of fiber. With even more anthocyanin than blackberries, the color of the skin indicates how much pigment is present. The darker, the more antioxidants. Several studies show the benefits of black grapes in the form of heart health, brain function, and blood sugar regulation. 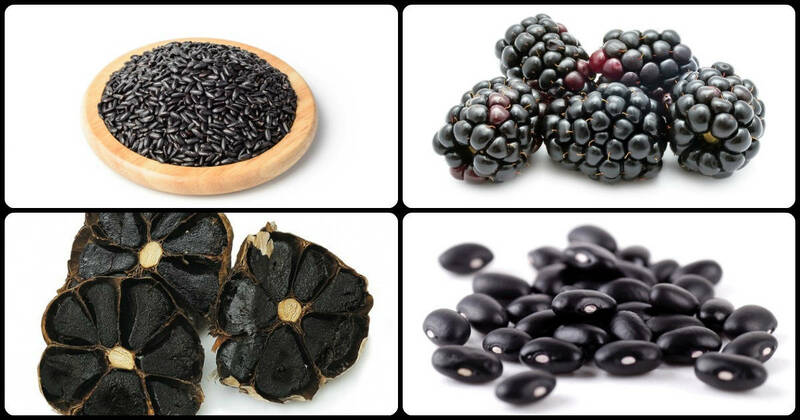 Not as common as yellow and green, the black variety is loaded with iron—about 8 milligrams per serving. Rich in fiber, they help support your immune system and lower cholesterol.